I bought a Google Chromecast today. It was $39. I figured it would work with most of the streaming services that I use. I figured it would be easier and more convenient than having to give up my iPad Mini for extended periods of time to the HDMI adapter cable on the TV to watch streaming stuff. And even though I have various iDevices, the Chromecast was significantly cheaper than Apple TV. I put it on the 32-inch 720p flatscreen in the living room. Does it work? Oh yeah. Netflix, YouTube and UFC Fight Pass worked really well right out of the gate streaming from their apps on my iPad Mini. But the whole process of getting it up and running was not without its weird glitches. Glitch 1: My 2008 Windows Vista laptop is too old to install Google Chrome. Yup. The set-up page rejected me. I had to use my iPad Mini to set it up. Glitch 2: My 2008 Windows Vista laptop wouldn't Google Cast from a Chrome tab. Or it wouldn't cast without some major, major, major lag and sound issues. Fortunately, my circa 2013 Windows 7 desktop computer didn't have the glitches that my laptop did. And I got some excellent tab streaming off my desktop computer for several streaming services that don't have Chromecast-compatible apps. So, based on my first 30 minutes with the Chromecast, I'm impressed. Now ... should I get a second one for the 46-inch 1080p TV in the basement? 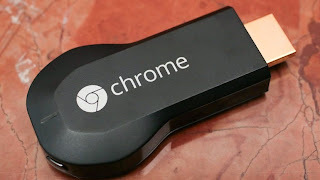 I bought the Chromecast this morning at a major retailer that is open early in the morning. I had checked their website to make sure they sold them. I'm walking through the TV electronics section and I can't find the Chromecast. There's a clerk setting up new demo TVs. Me: "Can you tell me where the Google Chromecasts are?" Clerk: "Google? We don't have Google! We only have the Roku" (starts walking me to the aisle) "and we are sold out of the Roku." Me: "Well, your website says you sell the Chromecast." Clerk: "No Google. Just Roku." So I walk down the aisle. To a whole shelf of Chromecasts in their boxes. And, yes, I did gently note this to the clerk as I walked by to go to the checkout.